President Trump is winning the battle for respect for our Flag, and the Freedom for which it stands. The 1st 20 teams to play this week had 11 players kneeling combined. 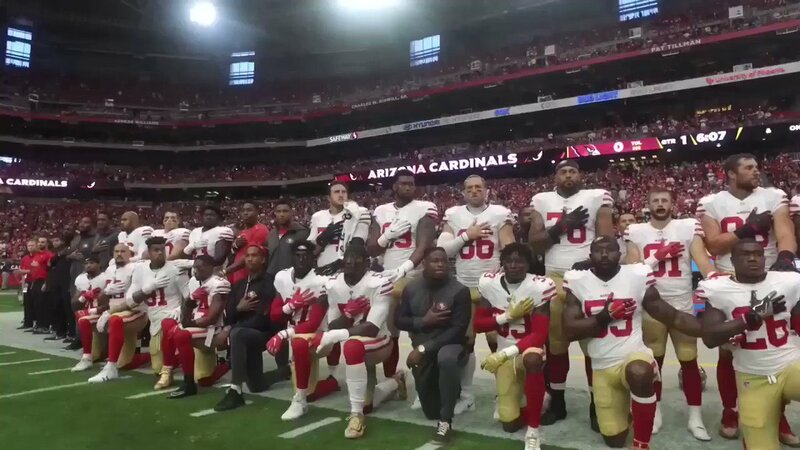 The 49ers, Colin Kaepernick’s former team, knelt but with there right palms over their hearts in a sign of respect. …Vs about 200 or just 15% that took ‘a knee’ last week, as a result of President Donald Trump contesting their actions when he said NFL players should be fired for kneeling during the national anthem. Early game day, only 11 players knelt or sat during the anthem, a number that nearly 3X’d when the San Francisco 49ers team knelt ahead of their game at the St. Louis Cardinals. Last week, about 180 NFL players didn’t stand for the National Anthem. This week? 11. A report Sundaysaid President Trump called Cowboys owner Jerry Jones to implore him to not kneel during the anthem last week. Mr. Jones and the team knelt ahead of the anthem but stood up for the anthem with locked arms. These NFL people are getting the message, the fans, and the sponsors do not want football entertainment politicized.